Federal proposals to address school safety through measures such as school-based police and metal detectors are “knee-jerk reactions” that could have dire consequences for some students, a coalition of civil rights leaders warned Monday. Civil rights leaders point to federal data and other reports that indicate minority children and those with disabilities are disproportionately arrested by school-based officers. Black students are more than twice as likely as their white peers to be referred to law enforcement or arrested at school, according to the 2013–14 Civil Rights Data Collection, the most recent federal Education Department statistics. Increasing police in schools is a “knee-jerk” reaction that gives people “the perception of safety,” Judith Browne Dianis, executive director of the Advancement Project, a nonprofit that focuses on issues of racial justice, said during a call with reporters on Monday. For some students, she said, increased law enforcement presence results in fear and anxiety. Although the U.S. Departments of Justice and Education recommend that school-based officers receive specialized training to work with students, it isn’t required under federal law. Since a former student shot and killed 17 people at Marjory Stoneman Douglas High School in Parkland, Florida, on February 14, calls for tighter gun control and other strategies to ensure schoolchildren are safe have taken center stage in Washington. One month after the fatal school shooting — among the deadliest in American history — the U.S. House of Representatives overwhelmingly approved the STOP School Violence Act of 2018, which would provide $50 million in federal money to help schools pay for security measures, including training programs that could help identify threats. Similar legislation with the same name is pending in the Senate. The Trump administration, meanwhile, is following suit. 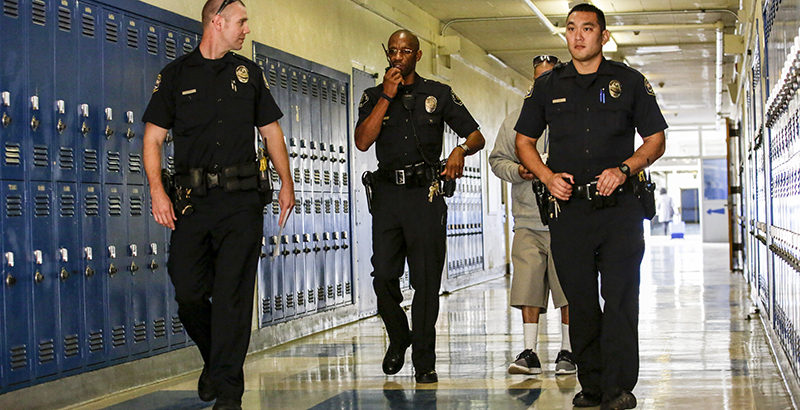 Last week, Attorney General Jeff Sessions announced plans to increase the presence of school police. Also up for debate are increases in security devices like locks on classroom doors and reinforced entryways. But their effects on disabled students should be weighed, said Curt Decker, executive director of the National Disability Rights Network. Some devices, he said, could make schools less accessible for students with disabilities. In order to promote school safety, the group said, educators and lawmakers should instead focus on implementing preventative measures like restorative justice and training teachers to avoid implicit bias. As schools explore safety policies, Decker said, they should refer to a 2014 guidance document the Obama administration produced to help reduce suspensions and arrests that disproportionately affect students of color and those with disabilities. Even before the Parkland shooting, U.S. Education Secretary Betsy DeVos was in talks with critics of that Obama-era document, who argue that the guidance created “racial quotas” in school discipline and ultimately made campuses less safe. Instead of leaning on cops, officials should instead increase funding for school counselors, mental health services, and social workers, said Todd Cox, director of policy at the NAACP Legal Defense and Educational Fund. “If Congress and the administration truly want our schools and students to thrive and be safe, the government must end the criminalization of our students of color and address excessive discipline that contributes to creating the school-to-prison pipeline,” he said.